Funny story, when I first saw the poster and promotional material I assumed that Randy Couture had taken over the role of Mathayus from The Rock. Seemed reasonsable except that Michael Capon, the blue Time Force Power Ranger was Mathayus and Couture was the villian of the story - Sargon of Akkad. It's a nice little adventure with Mathayus as a boy, against his father's wishes trying out to become a Black Scorpion, the elite Akkadian mercenary force. His father is killed through dark magic. He goes off trains for six years and returns to discover that the man who killed his father has upsurped the throne. There's a nice touch once he discovers Sargon is a magic user where he is off to Egypt to seek the Osiris Staff (from The Mummy Returns) but he his advised against that and seels the Sword of Domocles. Firstly do not use these films as any sort of historical reference. The first film says before the pyramids, this film a prequel has a character saying they were going to Egypt to see the pyramids. The CGI is not good Sargon becomes a giant scorpion who is mostly invisible which hides many sins but not all of them and at one point Mathayus and his party encounter a minotaur. I think he looks like the one seen in The Animated series, but we never get a good look at the beast. This was made in 2008 as a DVD tie in for Tomb of the Dragon Emperor. It must have done alright as they made another three after this (and could be planning more for all I know). Capon's Mathayus is fine, he's younger and I could see how he became the man from the first film. His female companion Layla is okay and the Greek poet Ari is quite entertaining. The trio put me in mind of Rick, Evy and Jonathon from the Mummy movies. I enjoyed this movie, it's not the greatest film ever but it wasn't trying for that. 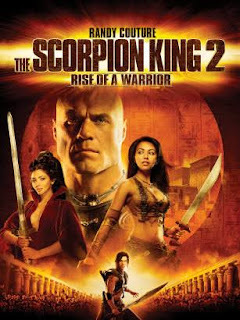 It's a simple revenge story with the first big adventure of the man who would become the Scorpion King.